The D700 is the ultimate enthusiast's DSLR, offering class-leading performance across the board. If you've got the money, buy one immediately! Nikon has been making top flight SLR cameras since the 1950s, but its newest model – the D700 – promises to appeal to enthusiasts and advanced amateurs as well as professionals. 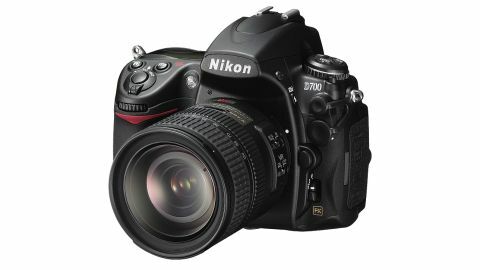 The D700 is Nikon's second FX format camera - the first was the flagship D3, which was released last summer. FX format is Nikon's term for full-frame – in other words, the CMOS sensor inside the D700 is exactly the same size as a frame of 35mm film. What this means is that unlike most DSLRs, where the effective focal length of your lenses increases by 1.5 or 1.6x, there is no focal length magnification, so a 28mm lens on a D700 behaves exactly like a 28mm lens on film. On a smaller format camera, like the D300, a 28mm lens becomes a 42mm (equivalent) because the sensor is smaller. The D3 is a pretty amazing camera. And the great thing about the D700 is that shares the same sensor, and many of the same features – and yet costs around £1,000 less. The D700's ultra high-resolution 920,000 dot 3in LCD screen and 12 million pixel CMOS sensor have been proven in the D3, and the D700 can shoot at ISO speeds spanning an incredible ISO 100-25,600. Alright, image quality at ISO 25,600 is nothing much to shout about, but if you've selected such a high ISO setting it's because you have to get a shot, and if you have to get a shot, any shot is better than none at all. Speaking of extreme situations, the D700 is rated 'professional' by Nikon, and as such, it's one hell of a tough camera. Every button and seam on the D700 is protected against water and dust, including the flash and the memory card door. That means that wherever you find yourself, in whatever kind of weather, the camera will probably give up the ghost long after you have. Which is comforting, right? So you've just come back from a war zone, or a natural disaster, but were the pictures worth the trip? Yes. Image quality in the D700's 'comfort zone' of ISO 200-6400 is extremely high. Along with the more expensive D3, the D700 is just about the only camera with which we would feel confident about shooting at ISO 1600+. In raw mode, images taken at settings up to ISO 6400 can be cleaned up very easily, making these ultra-high settings genuinely usable. The D700 features two raw modes, 14 bit and 12 bit. Shooting 14 bit raw files basically just guarantees more tonal data in the image, which should ensure smoother tones and a greater latitude for extreme levels adjustments in the finished image. In practice there isn't much difference between 12 and 14 bit raw, and selecting 12 bit frees up a bit more space on the card for more pictures. You'll need all the memory capacity that you can get with the D700, because the massive file sizes mean that average-sized memory cards won't last very long at all. In its normal 'body only' configuration the D700 can shoot at five frames per second, but add the optional MB-D10 grip (which also fits the D300) and continuous shooting up to 8fps is possible. Such a fast frame rate is useless if the camera's focusing can't keep up, but fortunately the D700 shares its 51-point AF system with the D3 and D300. Why is this fortunate? Well, this AF system is the best we have ever used, and knocks spots off anything else on the market. In 3D tracking mode, the D700 can actually follow a moving subject across the frame based on what colour it is. And in 51-point AF mode, the camera is programmed to look out for skin tones and facial features, making the focusing system as close to infallible as you'll find on any other DSLR. Even in extremely low light, the D700 doesn't skip a beat, thanks to 15 super-sensitive cross-type AF sensors in the middle of the frame. So what can't the D700 do? The answer is a predictable 'not much'. Not only does the rock solid build quality and large, bright viewfinder make it a pleasure to use, it turns out excellent images at ISO settings that would make other cameras blush. But if an extra few million pixels meant a decrease in high-ISO performance, we'll vote for 12 million. In fact, the only problem of any consequence that we have with the D700 is its price.